Technical Car Experts Answers everything you need: Toyota hilux assembly/disassembly and parts description. 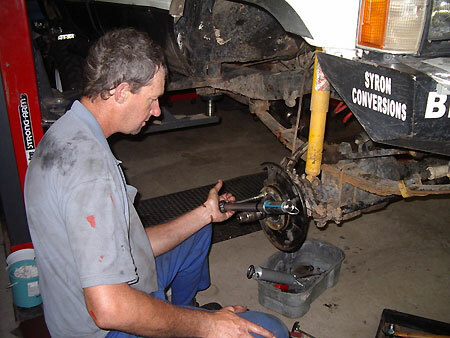 Toyota hilux assembly/disassembly and parts description. 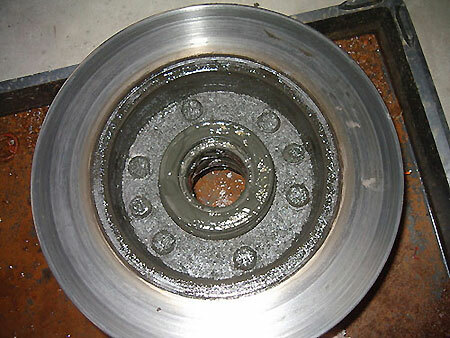 This photo belowshows just how much grease was leaking onto the hot brake disc and thus the smoke oily smell. Anyway both of the front wheels were removed and put away in a safe place. Out came the assortment of trays, and small bins that we put the various parts that we strip off so that we keep everything separate, just makes the assembly more easier. 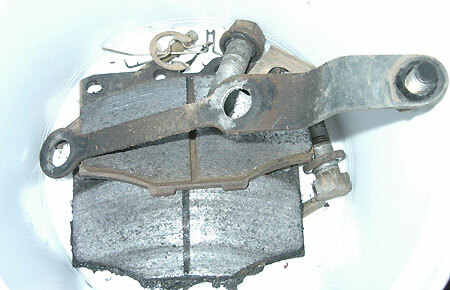 This photo above once again shows you the grease oil also found at the front brake pads. Now step by step basically using some photo's I will explain to you the basic way that I went about stripping the right front section of the axle, the left side is very similar, however the side shaft is longer on the left side of the axle, because the pumpkin (centre part of the diff is not central, it is to the right side of the vehicle). Use a pair of C- Clip pliers and open this clip and remove it, for safety wear a pair of protective glasses when you do this, sometimes the clip goes flying across the floor, once you have managed to remove the clip, dump it in a separate container to be washed. 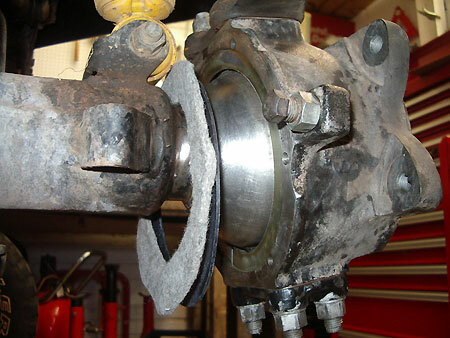 Okay so you have managed to remove all the cone washes, now remove the free wheel hub body, also place it in a cloth rag and place to one side. 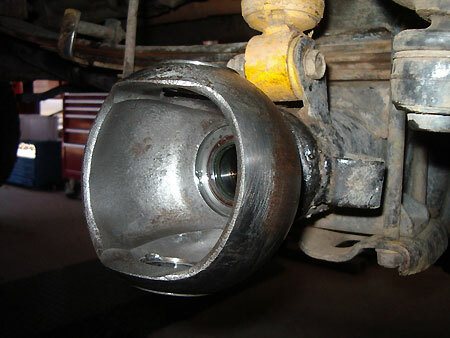 Once you have removed the free wheel hub body, also wrap it in a piece of clean rag and place it to one side. Now you will see the first nut, then a locking washer, then another nut then a thicker spacer washer, to be able to remove the first nut, you have to look for the place on the flat of the nut and with using a flat chisel, unlock the tab, instead of stuffing up the nut using a hammer and a flat chisel to loosen the nut, we have got this excellent idea instead. 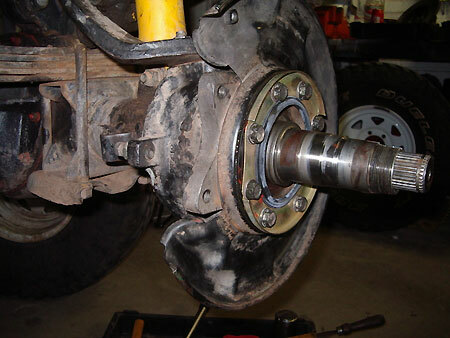 Sometimes the round axle end will be very rusted, you might find rust pit marks, use sandpaper and clean up the surface as best as you can, if you think that the pit marks are very deep, send me some pic's and I will let you know if you can still use this axle housing or not. 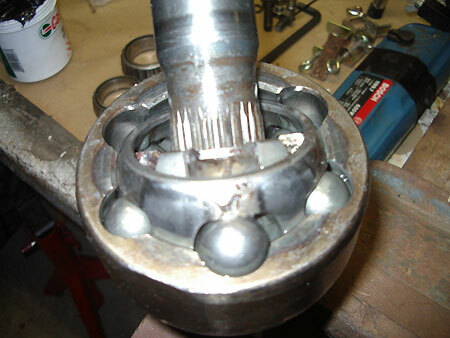 Torquing the upper and lower swivel hub nuts. When you remove the top and the bottom swivel hub bearing retaining blocks, you must make sure that you do not get the spacer plates mixed up, whatever you take out the bottom must go back in that way, the same goes for the top, these spacer shims are a special thickness to line up the side shaft in the housing, this was done by the factory when they re-assembled the front axle. 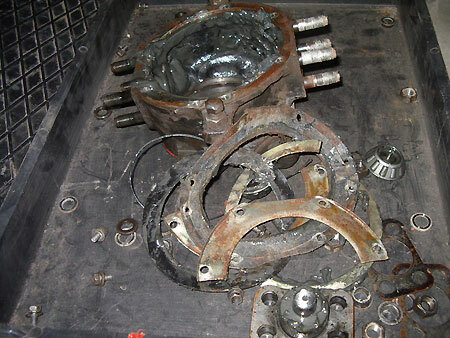 Just some photo's showing the various parts that were stripped off and placed in separate trays for cleaning. 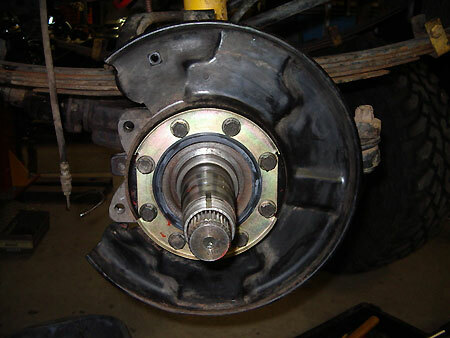 The brake parts, make sure that you do not loose the anti-rattle springs. So now it is time to fit the metal backing half moon plates to the rear of the swivel hub, if you look carefully at the other photo you will see that the felt gasket must be put on first, then you get the rubber seal and then the metal split flat ring, the flat ring fits into the groove recess on the back of the swivel hub housing, there is no torque for these bolts but you can just tighten them using a size 10mm short spanner, the reason why I say use a short spanner is because you will not have lots of leverage so that you will snap off the small bolts if you over tighten them. But I did use a torque wrench set at to start with at 10nm, then used a spanner. You have to make sure that you fit the half moon plates the correct way, see the above photo for details. Do not put any grease or oil on these seals, rather leave them dry when you re-assemble them. Now comes the messy part, you can wear some surgical gloves but I prefer to just use my bare hands and fingers, get a better feel if there are any rough edges. 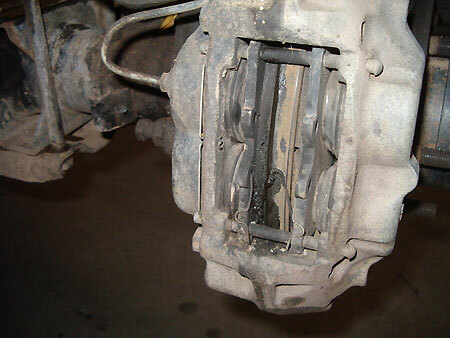 the only time that you will see that this joint is stuffed up is when you rip the vehicle through a difficult section and you hear grinding noises coming from the front axle and you will also loose traction from that wheel. Place the shaft in a vice like in the pic above, then make sure that your hands are clean, take one last sip of your beer, because it will be a while before you can pick up the bottle again. 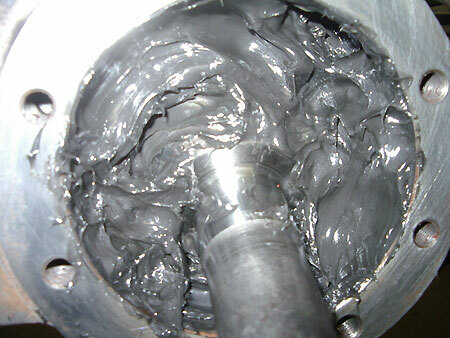 Grab a tub of CV Joint grease also known as MS grease, scoop some out with your index finger and then start to push it down into the joint, it is quiet easy, if you are in a climate that is very cold, you can heat the grease slightly to make it more easy to work with. So have a look at the pic below and you will see just how messy this small important job really is. Now clean away any excess grease from the flat surface where the gasket goes between the spindle axle shaft and the swivel hub housing, clean the metal surface with some meths to make sure that there is no oil substance left on the metal, now smear some silicone gasket maker on both surfaces, but not too much, fit the gasket and then the axle spindle. Torque the bolts to 60nm and test with a spanner afterwards. 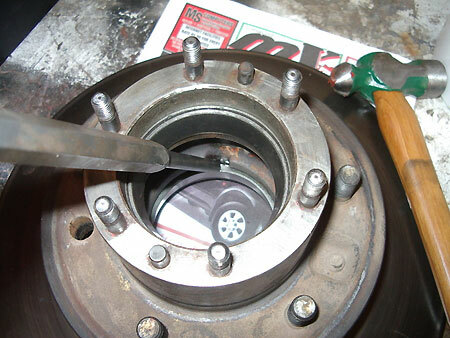 Now we go to the wheel bearing hub, however as I said earlier in this topic, one of the wheel studs was broken, thus to remove it, place the bearing hub which also consists of the brake disc on a nice flat piece of wood on your wood bench, use a round steel chisel that is smaller than the OD of the wheel stud and give the drift a few light taps with a hammer, the stud will come out, you have to just use a bit of common sense to determine which direction the stud will come out, you will see that there is a top hat section to the one side of the stud, tap the stud on the broken off section. 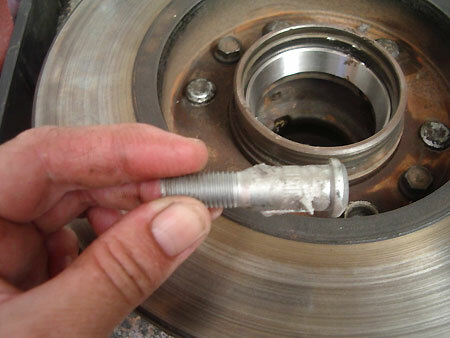 Once you have removed the broken stud, use some copperslip or anti corrosive paste, smear a little on the shank of the new wheel stud, insert the stud and then use the same drift, just tap it into position until the top hat section is flush with the inside of the brake disc. Be careful of your fingers, otherwise you will loose a nail or two and I can tell you that is sore. 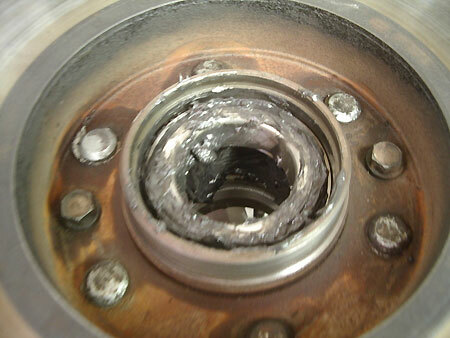 Now take another suitable chisel or drift and have a look inside the bearing hub, you will see the bearing cups, they come out one way only, if you are looking at the hole, they come out towards you from each end, you will see a small area that is just big enough for you to be able to put the end of the drift against the bearing cup, give the drift a few taps and the cup will come out, sometimes if you battle you may have to smack it harder or use a hydraulic press instead. 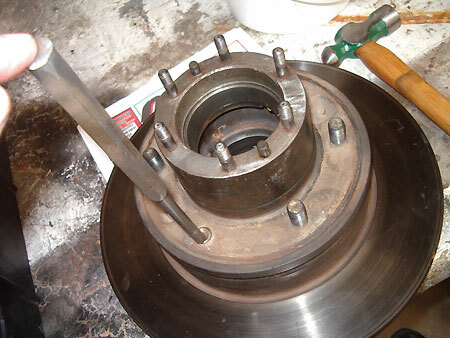 Now to refit the new bearing cups you must once again smear some anti corrosive paste on the outer surface, this will make them easier to remove the next time you have to change the wheel bearings. You do not have to worry about getting the bearing cones mixed up, they are not the same size, however it is always better to just use a cable tie through the one so that when you have greased it, you will know where it goes, to grease a wheel bearing cone there is only one way and what I find is the best way to do this is to smear some grease we once again use MS grease for this application, do not use wheel bearing grease we find that wheel bearing grease will not work well here, because when you reassemble the manual locking hub, the MS grease in the hub will mix with the wheel bearing grease and then you will have a gemors, we have also found that the MS grease can handle the water if it enters the wheel bearing cavity. To grease the wheel bearings, use the palm of your one hand, put grease in your palm and then use your other hand and grip the bearing and push the wider side where the rollers are up against the flat of your palm, this will force the grease in between the rollers so that you will see it come out the other side, do this the whole circumference of the bearing cone, then place the bearing in a clean place, do the same to the other bearing, before you put the inner bearing into the bearing housing, first smear some MS grease into the housing, not too much because if you do overfill the housing your wheel bearings will overheat. 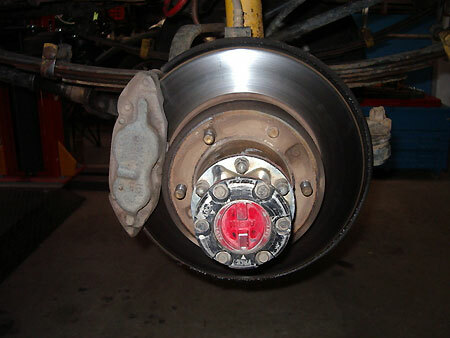 This photo above shows you that once you have fitted the wheel bearing axle shaft, you must remember that you still need to fit the brake disc backing plate, there is also another metal plate that also has a rubber seal mounded into the plate, you fit this plate with the seal lip towards you, see pic. Then screw in the bolts and torque. 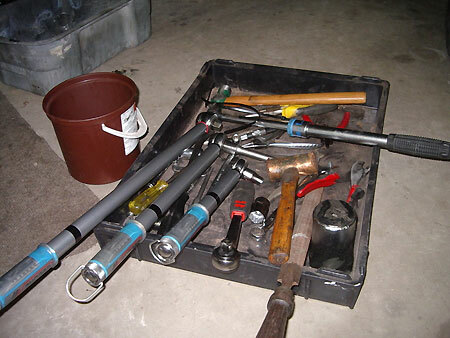 Note in this photo below, the three different size torque wrenches, they are for the various torque setting sizes that are required, these wrenches are very expensive, thus do not drop them, the smallest size costs R1200. 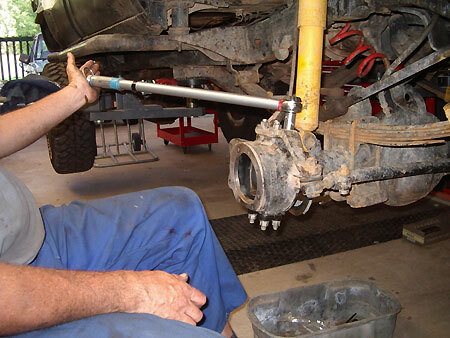 Parts to buy when you overhaul the front axle of a Toyota Hilux solid front. Upper swivel hub bearings taper x 2. 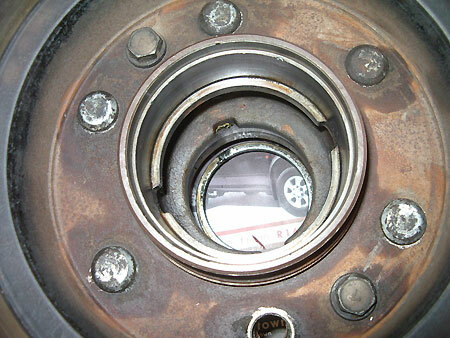 Lower swivel hub bearings x 2 taper. 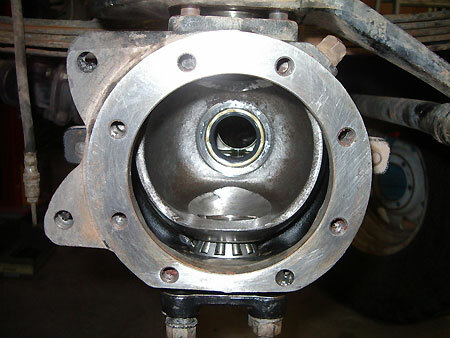 Inner housing side shaft seals, (these seals fit into the axle housing from the inside, they go in only one way, with the spring towards the pumpkin, when refitting the side shaft on the left side be careful not to damage this seal, the side shaft on the left side is much longer than the side shaft on the right side. 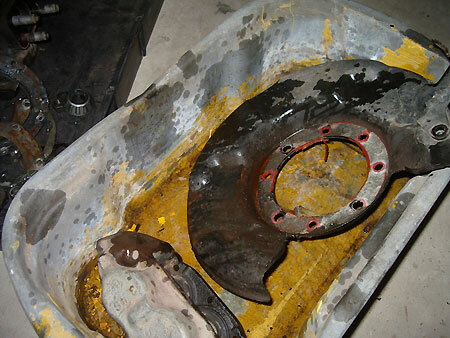 You will also need 1 x pumpkin diff housing centre portion gasket, (if you remove the diff from the housing, it is a good thing to do then you can clean out all the muck at the bottom of the diff housing if it is an older vehicle. 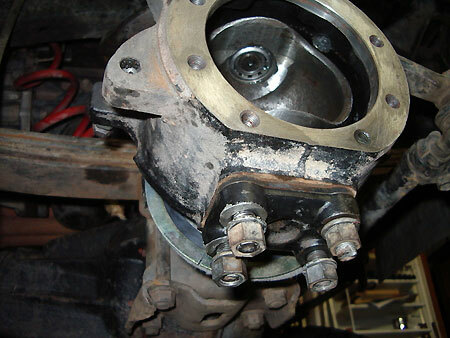 Remove the prop shaft, do not remove the pinion nut, this is set with a pre-load, loosen all the bolts and nuts around the housing, but remember you have to have the side shafts out first. 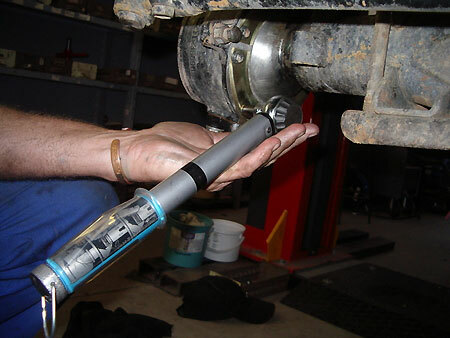 1 x larger torque wrench 50 to 250nm. 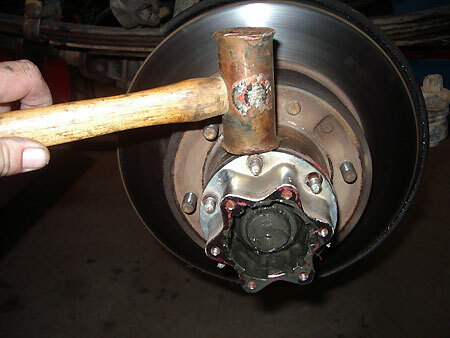 Copper head hammer (to tap taper split collars from locking hub housing and swivel hub housing). Camera to take pic's before you strip or have a look here. Normal set of spanners, flat ring, you will have to modify some Cir-clip pliers for the snap ring on the side shaft splined end, you have to grind a flat on the outside, this ring is a B..ch to fit.the pliers must be the type that open when you push the handles together, not too small pair. Labels: Toyota hilux assembly/disassembly and parts description.